This was the first meeting in nearly 10 years in which only one reporter was in attendance. It highlights a question that has been on my mind a great deal lately. How’s the health of our local news? Many would agree that it is struggling – especially in small to mid-sized communities. If this is true, what is the potential effect on our community wellbeing – indeed, our local democracy – if it fails? How will it affect our ability as a local government – and that of other community partners — to engage with residents? The civically engaged – the people who vote, volunteer and connect with those around them – play a key role in community life. A study by Pew Research Center in association with the John S. and James L. Knight Foundation looks at the civically engaged in local communities. 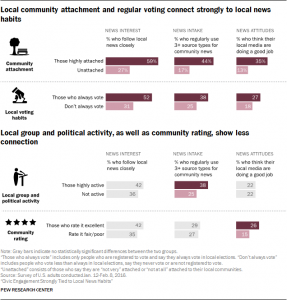 The study reveals that, overall, the civically engaged are more likely than the less engaged to use and value local news. The roughly one-in-five U.S. adults (19 percent) who feel highly attached to their communities demonstrate much stronger ties to local news than those who do not feel attached – revealing a link between personal connection to these areas and a desire to stay more informed about current issues and events. We know that local news is a vital tool for civic engagement, and local newspapers are key. The FCC has reported that as much as 85 percent of the news that feeds local democracy comes from local papers. But with declining circulation, many newspapers are changing hands or going under. 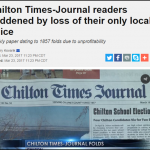 Newspapers like the Chilton (WI) Times Journal, which folded earlier this spring, are among them. The end of 160 years of publication saddened residents, who characterize the folding as a tremendous loss. “It’s a community resource — that’s how people find out about what’s going on around town , other than word of mouth,” Jovian Scafati, a local resident expressed to WFRV-TV Local 5 covering the story out of Green Bay. In order to save costs, newspapers — increasingly owned by consolidated companies — often “discourage extensive local reporting in favor of more broadly applicable content. In other words, the larger the media firms became, the less connected they were to individual communities.” Local news is hurt further by consolidated ownership when as part of leveraged buyouts, there are layoffs of newsroom staff. I agree with this idea and suggest an expansion on the notion of government support. Enlist assistance — to a greater degree than the current model – from those public information officers (PIOs) and various communicators who currently work in local governments including cities, counties and independent school districts. Turn to them for assistance in providing local news – including information about basic public services, highlight local issues that require public input, explain the shared rules and policies we live by, and tell the history and culture that define community character. As president of the North Carolina City and County Communicators, I am proud of the innovation in community engagement, new media experimentation, and emergency communication strategies being tested among our membership. We are communications professionals creating content and engagement opportunities on government websites, government cable channels, social media channels, and at public information meetings. We are videographers and photographers, webmasters and social media posters, writers and editors, citizen academy educators, and much more. We are passionate about community engagement and believe that communication lies at the heart of good governance, transparency and accountability. We work very closely with news media to tell the story of our governments, and to interact and engage to enrich people’s lives. Today, our direct-to-consumer communication channels are stronger and growing. In this era of so-called “fake news” and media manipulation, the implications of government employees providing local news suggest that we may need strengthened professional standards that give assurance of the public information officers’ political neutrality. Our professional focus is on public information and engagement — as a valuable public service. How do we fit into an emerging new picture in the delivery of local news? I’m not sure what a new collaboration might look like, but I would like to open the discussion — and share that we public information officers are willing and committed partners. Currently, we are surveying media who cover the Town of Chapel Hill. It includes an open question – “How can we assist journalists, who are asked to do more with less, to encourage local coverage that represents and responds to the needs of our community?” I am looking forward to discussing this more with local newsroom editors and journalists. So far, only two have taken the survey, which is still open. Thank You! How can we help? Back to our reporter at the budget briefing. 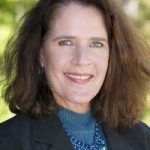 Her name is Tammy Grubb, and she and the Chapel Hill News/News & Observer are performing an important community function in covering the news of our town (pop. 59,000). 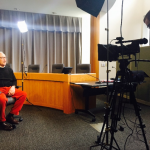 She wrote this story about the proposed budget, and also posted this video of Town Manager Roger Stancil discussing budget uncertainties. To you, Tammy, and many other journalists who are reporting on our local communities – Thank You! How can we help? Very well done! It’s been a trend for years as less and less media outlets attend meetings or report on items of public importance. I remember back when I was a reporter covering school board meetings, there four newspaper reporters and a couple of radio news reporters present at the meeting. PIOs play an ever more pivotal role in spreading the good (and sometimes not-so-good) news about what a city or county is doing. Plus, today, everyone is a “journalist” on social media. We need to support our local media and help them report accurately. Thanks for the great article, Catherine! Gary – would appreciate your further thoughts on >>Plus, today, everyone is a “journalist” on social media<< This idea of a "low bar" for reporting and commenting on local affairs via social media seems to hold hope and caution. Hope in that more voices can be heard, and faster, and without filters. Caution in that standards for news gathering, context, clarity and transparency of sources may be diminished. Can you say more about your views on social media and its role in (some forms of) journalism? Thanks. Well, John, the usage of social media as “news media” scares me to some degree because rumors (or even “fake news” in terms of politics) can be quickly reported as facts and spread like wildfire. Ask yourself this question: When I hear about someone getting murdered in my neighborhood, do I turn on the TV to watch the local news? Do I turn on the local radio station? Or do I open the Facebook or Twitter app? Most of the time, I do the latter. There is simply no fact-checking or attribution to the information being posted, although many times at least a portion of the information is true. I try to at least check the local newspaper’s or local radio station’s Facebook page first to get hard news. It’s just food for thought, but it does seem like traditional news media are having to adapt to our new “social” lifestyle. I agree, I feel it’s very important that we maintain a healthy news system and stay informed on the happenings of our community. With newspapers declining, we must be more creative with how we get the information to our citizens and this article lays out all the issues in the table. Thank you! Great post, and another reminder of the importance of a free and independent press. Local newspapers certainly aren’t perfect, but as the author stated, they’re often the only ones watching over meetings that may not appeal to other media outlets. A good reporter also builds trust with officials, gaining a better perspective of what stories are important and why. Professional government communicators (aka PIOs) are an important link right now – they know the ins and outs of local government, are effective writers, and are often former journalists. They typically push for more transparency (televised meetings, budget presentations, etc. ); however, as noble as their intentions may be, they are beholden to the organization’s leadership. Management and elected officials must also believe in transparency for a PIO to communicate well. Now that The Chapel Hill News has been reduced to a source for restaurant reviews and recipes, the citizens of Chapel Hill have lost their best source of independently published local government news. They also have lost an active community forum, where opinions of editors and citizens focused attention on community issues. How will citizens learn about actions of the Town Council? How will they sound an alarm to alert their fellow citizens when they believe some wrong has been perpetrated? What forum will they use to criticize the Town Manager and the Mayor? Where will citizens learn of zoning and development issues? Perhaps it is time for the Town Council to create a replacement news source and forum, led by an independent editorial board of appointed citizens, and staffed by professional journalists. health of communities and citizenship in North Carolina, Michigan and Alaska. Thanks for thoughtful comments and conversation, which I hope we continue and expand widely.